He graduated back in 2000 from tehran university, he is by far the coolest member of team!! !, he loves pets and chose to become a veterinarian when he was only 3 years old!, he got married to a colorado native due to his good looks :) and moved to the states back in 2004, his goal has always been providing the best quality of care for animals and he managed to bring his dream to reality in summer of 2012, you will recognize him as Dr.S, he provides vast variety of medical, surgical and diagnostic procedures, way to go Dr.S!!!!! 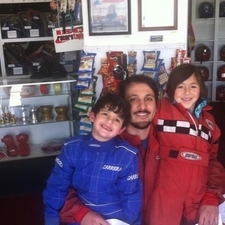 he loves Go Kart Racing as you can see in picture, he has two boys "Mohammad" and "Noah" and a girl "laila" a dog "jessie" and two cats "cinnabon and Thomas", they are all car crazy like their dad! and not to mention that he is a "private pilot" aswell !!! Meaghan is a true Colorado native, orginally born in Monument. She attended Colorado State University in Fort Collins and earned her bachelor's degree in wildlife biology. She then spent two years working for the Colorado Division of Wildlife as a field technician She spent her time trapping sage grouse, relocating elk, and monitoring migration patterns of bats! As exciting and challenging as this was, an internship position in Dallas, Texas lead Meaghan to a career in veterinary medicine. 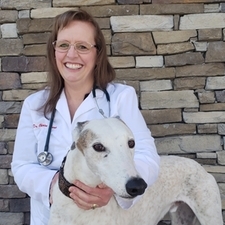 She earned her Doctor of Veterinary Medicine degree while attending Ross University in St. Kitts and completed a year of clinical training at Colorado State University. 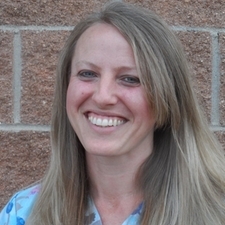 Meaghan has a strong interest in internal medicine, dentistry, and ultrasonography. 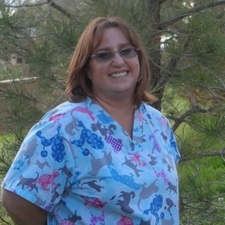 She is looking forward to meeting you and your pet and is committed to providing top quality care. Meaghan and her two cats, Binx and Ella feel so lucky to be able to live and work in Colorado where endless biking, snowboarding and mountain adventures await! Christine Duree has been a great addition to Happy Tails. She recieved her degree in Veterinary Medicine at Kansas State University. She also holds a bachelor's degree in Animal Science and Industry and is certified in Veterinary Acupuncture. 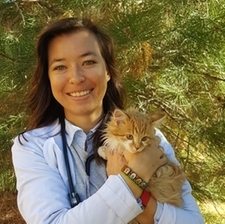 Born in Wichita, Kansas Christine has felt a calling since 5th grade to become a veterinarian. She loves teaching others as well as learning new things herself. She believes that by creating a good relationship with people you lead yourself to success. Christine is an incredibly hard worker, however does enjoy relaxing and spending time with her husband and son. She is fond of traveling and currently has exploring Europe and visting Disney Land or Disney World on her bucket list! 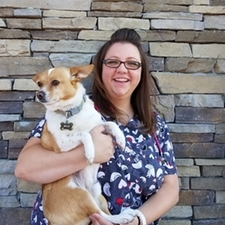 Michelle helped Dr. Shekarchian open Happy Tails Pet Hospital and has since devoted her time and energy in making sure things run smoothly and clients are happy. She strongly believes that in order to be truly successful, client satisfaction and exceptional quality care to the patients ensuring health and happiness are the key ingredients. Michelle graduated from Bel-rea in 2001 and has been working hard in the field ever since. When she is not being a workaholic, Michelle enjoys spending time with her husband and two teenage children. She also cares for two boxers that are both full of energy and always entertaining, and two cats. On her down time, she enjoys hiking and anything that requires her to get into water. 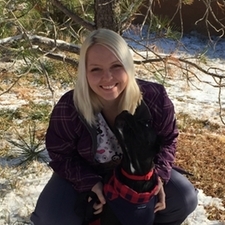 Heather has been with us for a year, working closely with patients and clients to make sure they are educated and comfortable with whatever diagnostics or treatment that might be needed for their pets. Her client communication is outstanding and her personality cheers everyone up. Heather is married and has 2 children. She loves spending time with her family and dogs, and has a crazy entertaining kitten that she had rescued after a client had found her abandoned in a field. 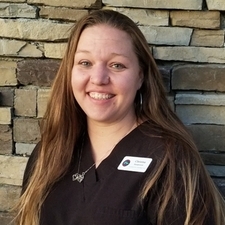 Christina was born in Texas and Raised in Colorado. . She has worked in human medicine for over 13 years, however she decided to change fields due to her strong desire to explore veterinary. Her skills in client service and her compassion has definitely carried over. This has enabled her to be an enormous asset to our team! She has found that working with animals to be fun and rewarding. When not working hard, she enjoys the outdoors and spending time with her family. She has recently added a new four-legged addition to her family named D'Sue. No one knows quite where the name came from but her little boy thought it to be quite appropriate! Brittany is another important asset to our hospital! She plays a vital role in assisting our surgical team in monitoring anesthesia, care of patient s during pre and post op recovery, filling medications, and preparing pets for discharge. She has quite the bubbly personality and is always up for any challenge thrown at her. She was born and raised in Aurora Colorado, however had spent the last 4 years in California and Florida while her husband was in the Navy. 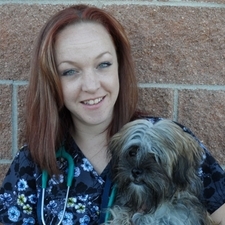 Brittany has obtained a license as a veterinary Assistant and has a strong interest in Oncology. She currently has two spoiled dogs named Anubis and Tazz. Sean joined Happy Tails Pet Hospital in 2015 and has proven to be quite an asset to the team. He has an awesome personality and knows how to lighten up a stressful situation and make the day brighter. 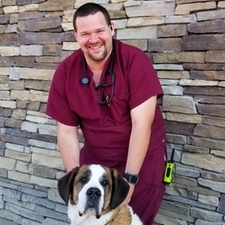 He is caring and wonderful with the clients and is devoted to making sure they feel comfortable with any treatments or diagnostics that may be recommended to ensure their beloved pets get the best care possible. Sean attended Bel-Rea in 2012 to become a veterinary technician, however he has been working with animals for 13 years. 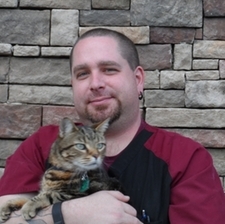 About 12 years ago, Sean began working with feline behavior and assisted many owners in resolving behavior issues and strengthen their bonds. He has also received his certification in training and has been training dogs for the past 10 years. In his spare time you can find him rocking out at a metal concert or enjoying fine crafted beer at a beer tasting. 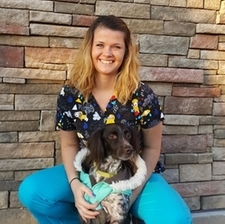 Lindsey is currently attending Bel Rea to earn her degree in Veterinary Technology and plays a key role at Happy Tails Pet Hospital regarding maintaining cleanliness, patient care and monitoring overnight patients. She is very sweet and kind at heart and is a valuable asset to the practice. Lindsey grew up in Central Wisconsin and recently moved to Colorado to attend school. She has loved animals since she was very young. She has had many pets growing up, from dogs and cats to goats, pigeons, cows, and rabbits! She has worked as a herdsman for several dairy farms in the past 5 years before seeking her veterinary technician degree. In her free time, Lindsey enjoys camping, hunting and fishing, as well as spending time with her nephew.